anemeth added a comment to D18798: [KIO/drag and drop] Fix file and folder drag and drop popup menu transparency. anemeth added a comment to T9041: New "Home" tab for Kickoff. In your mockup, do you want to make the power buttons always visible? When we moved from windows 7 to windows 10 the #1 user ticket was "how do I shut down the computer?" and "how do I log off?" because these actions are on a button with no label. In my opinion shutdown, restart and logoff should be visible on the main page, opposed to the current Leave page, but suspend and hibernate could be tucked away for example in a little arrow next to Shut down. I'd like to add my humble thoughts to this if you don't mind. I personally really love this proposed start menu, especially the list of newly installed apps. anemeth added a reviewer for D18798: [KIO/drag and drop] Fix file and folder drag and drop popup menu transparency: kde-frameworks-devel. 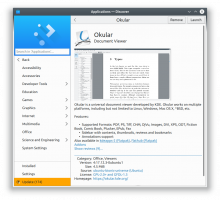 anemeth added a reviewer for D18798: [KIO/drag and drop] Fix file and folder drag and drop popup menu transparency: Frameworks. anemeth requested review of D18798: [KIO/drag and drop] Fix file and folder drag and drop popup menu transparency. anemeth committed R108:3c2148a5fbc4: [effects/blur] Update blur to be more natural (authored by anemeth). anemeth closed D18377: [effects/blur] Update blur to be more natural. anemeth added a comment to D18377: [effects/blur] Update blur to be more natural. Please re-title the change, it should look something like "[effects/blur] ...". Also, please remove the video link from the summary. anemeth updated the summary of D18377: [effects/blur] Update blur to be more natural. anemeth updated the test plan for D18377: [effects/blur] Update blur to be more natural. anemeth updated the diff for D18377: [effects/blur] Update blur to be more natural. @zzag @fredrik what do you think now? Given all this, it's probably best to limit this to desktop GL for now. @fredrik swoops in and solves every problem! I tried experimenting what fredrik suggested without luck so far. @fredrik @zzag is this the correct approach? This gives the exact same result as not using sRGB textures. anemeth added reviewers for D18377: [effects/blur] Update blur to be more natural: davidedmundson, zzag. anemeth added reviewers for D18377: [effects/blur] Update blur to be more natural: VDG, KWin. anemeth requested review of D18377: [effects/blur] Update blur to be more natural. anemeth added a comment to D12285: [RFC] Change drawer header image. You put an image there for the sake of an image being there. It is completely irrelevant to the menu. How about putting there something relevant, like a png image of a phone and tablet and computer there showing connections? anemeth resigned from D15880: Khelpcenter menu does not work (some parts of TreeView not expanded). anemeth added a comment to T8707: Window borders. I think the vertical and horizontal gray lines look great. Less so the diagonal ones that make up the corner. It still looks great when the corners are over a dark area but when over a light area the rounding looks off. It's like the opacity isn't completely right. It is actually also visible in the screenshot you posted. If you look closely (or zoom in) on the lower right corner on the window with Konqi you can see that a few pixels are "off"
Does your effect keep the corners square when the window is tiled or maximized? If anyone interested there is a KWin effect that rounds the corners of windows. anemeth added a comment to D15683: Add lock icon to desktop context menu. My arcanist is still borked. Could someone please push this? Thank you. anemeth retitled D15683: Add lock icon to desktop context menu from Add lock icon to context menu to Add lock icon to desktop context menu. anemeth added reviewers for D15683: Add lock icon to desktop context menu: ngraham, VDG. anemeth requested review of D15683: Add lock icon to desktop context menu. anemeth added a comment to D15435: Add translucent background attribute to desktop icon popup menu. I'm having problems with my arcanist. Could someone please land this for me? anemeth retitled D15435: Add translucent background attribute to desktop icon popup menu from Add translucent background attribute to popup menu to Add translucent background attribute to desktop icon popup menu. anemeth updated subscribers of D15435: Add translucent background attribute to desktop icon popup menu. anemeth updated the summary of D15435: Add translucent background attribute to desktop icon popup menu. anemeth added reviewers for D15435: Add translucent background attribute to desktop icon popup menu: hein, davidedmundson, Plasma. anemeth updated the diff for D15435: Add translucent background attribute to desktop icon popup menu. anemeth requested review of D15435: Add translucent background attribute to desktop icon popup menu. anemeth abandoned D12545: Set focus on the filename line edit when a file is selected. @ngraham I'm sorry, but because of my new job I don't have much free time left so I can't actively develop anymore. I'd really like if someone took over this patch. anemeth added a comment to D12804: Fix window frame rounding when scaling is used. anemeth updated the diff for D12804: Fix window frame rounding when scaling is used. anemeth added a comment to R319:452cced03e40: Revert "Show the scrollbar only when needed". anemeth added a comment to D13579: apply blur to windows using Konsole as KPart. anemeth updated the diff for D11843: Show the scrollbar only when needed. 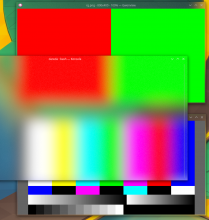 anemeth added a comment to D12678: Fix multimonitor blur. How about a nice gradient between them? anemeth committed R125:311324a004c7: [Khelpcenter] Use HiDPI icons (authored by anemeth). anemeth closed D13265: [Khelpcenter] Use HiDPI icons. anemeth added reviewers for D13265: [Khelpcenter] Use HiDPI icons: davidedmundson, lueck. anemeth requested review of D13265: [Khelpcenter] Use HiDPI icons. anemeth added inline comments to D13246: [effects/blur] Check for blitting support. anemeth committed R108:81f38abe6d6d: [effects/blur] Check for blitting support (authored by anemeth). anemeth closed D13246: [effects/blur] Check for blitting support. anemeth retitled D13246: [effects/blur] Check for blitting support from Check for blitting support to [effects/blur] Check for blitting support. anemeth added reviewers for D13246: [effects/blur] Check for blitting support: KWin, davidedmundson. anemeth requested review of D13246: [effects/blur] Check for blitting support. anemeth committed R108:b3b691a25074: Fix blur on Wayland when scaling is used (authored by anemeth). anemeth closed D12700: Fix blur on Wayland when scaling is used. anemeth added a comment to D12700: Fix blur on Wayland when scaling is used. You can just download the patch as raw diff, reapply to current master and copy the description text from Phab in a new commit message (copy the scheme from earlier commits). Could someone please land this revision? My arcanist has a problem with this patch. anemeth committed R108:99532fb95c1e: Fix multimonitor blur (authored by anemeth). anemeth closed D12678: Fix multimonitor blur. anemeth committed R108:8342cdd3b6d9: [libkwineffects/kwinglutils] Calculate correct srcY0 and srcY1 in… (authored by anemeth). anemeth closed D12452: [libkwineffects/kwinglutils] Calculate correct srcY0 and srcY1 in GLRenderTarget::blitFromFramebuffer. What if we used the same color as the titlebar? I think you're facing one of X11 issues. anemeth updated the diff for D12848: Set fix steps for icon sizes. anemeth updated the summary of D12848: Set fix steps for icon sizes. anemeth updated subscribers of D12848: Set fix steps for icon sizes. anemeth added reviewers for D12848: Set fix steps for icon sizes: Frameworks, VDG. anemeth requested review of D12848: Set fix steps for icon sizes. anemeth committed R374:8c356069a9df: [Kolourpaint] Use HiDPI icons (authored by anemeth). anemeth closed D12582: [Kolourpaint] Use HiDPI icons. anemeth committed R374:b0baf57142cd: Add .arcconfig file (authored by anemeth). anemeth closed D12805: Add .arcconfig file. Also: how does it work with multiple monitors ? (I see you get the info from ::primaryScreen, not for the screen the window is actually on ? anemeth added a reviewer for D12804: Fix window frame rounding when scaling is used: davidedmundson. anemeth added reviewers for D12805: Add .arcconfig file: aacid, lueck, davidedmundson. anemeth requested review of D12805: Add .arcconfig file. anemeth updated the test plan for D12804: Fix window frame rounding when scaling is used. anemeth added reviewers for D12804: Fix window frame rounding when scaling is used: Breeze, VDG, hpereiradacosta. anemeth requested review of D12804: Fix window frame rounding when scaling is used. anemeth added a comment to D12582: [Kolourpaint] Use HiDPI icons. The only thing I found that was out of place was the action menu icons. They don't seem to honor the Qt attribute. anemeth committed R241:c537a717363c: Allow accepting by double-click in save dialog (authored by anemeth). anemeth closed D12538: Allow accepting by double-click in save dialog. anemeth updated the diff for D12538: Allow accepting by double-click in save dialog.